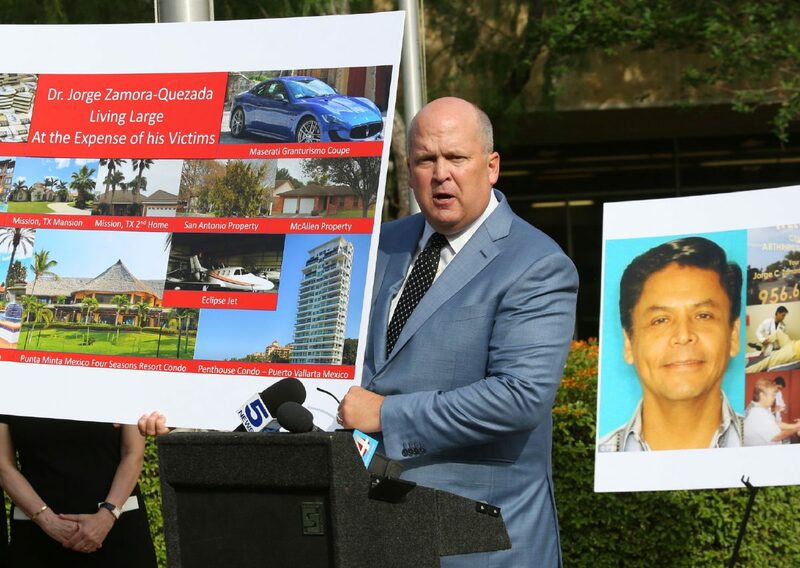 Attorney Michael Watts holds a poster while talking about charges against Dr. Jorge Zamora-Quezada at a news conference Monday, May 21, 2018, at the Hidalgo County Courthouse in Edinburg. 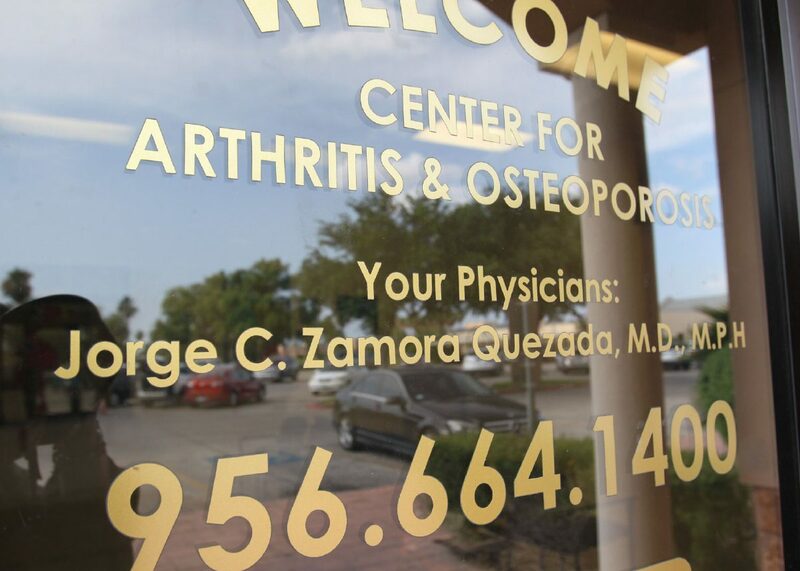 EDINBURG — Posted on the front door of the Arthritis & Osteoporosis Centers here is a sign asking patients to show their support for Jorge Zamora-Quezada, the rheumatologist who was arrested last month on charges of healthcare fraud. Walking into the darkened lobby, the only light coming from the receptionists’ desk, the office nearly resembles an abandoned building, where just nine of 45 employees remain since Zamora-Quezada’s arrest. Most employees had to be laid off, said Victor Zamora, one of the doctor’s sons, as the business has suffered financially since the allegations surfaced. What is really hurting the business, he said, is that Zamora-Quezada is being held without bond pending trial. Two federal judges denied the doctor’s release and he will therefore remain at the East Hidalgo Detention Center in La Villa. “The fact that he’s not on bond is what’s completely making this impossible to work,” he said. Were he to be released on bond, the 26-year-old Zamora said his father would be able to continue seeing patients as his license is still active. However, it is typical for judges to set conditions when defendants are released on bond and it is unclear how likely it is that he would be allowed to see patients if he were released. The U.S. Attorney’s Office did not return a request for comment. The doctor’s license remains active, according to the Texas Medical Board’s website. A communications officer for the board could only comment to confirm the status of his license and to say the board is aware of the indictment and is monitoring his custody status, the officer wrote in an email. To keep the license active, the younger Zamora said the office is complying with requirements. As of Wednesday morning, they had more than 300 requests pending, which they’re working on at a pace of 10 records a day. So patients should expect to wait about 20 to 25 days to receive them. Once patients get their records, he said, it will take another five to six months to be referred to another rheumatologist. Even once they’re referred to another specialist, they cannot issue medication. “Even if it’s yours, we can’t give it to you,” he said. “We need you to send another physician’s office with somebody specially equipped to transport the medication. He is alleged to have defrauded health insurers by over-treating patients based on misdiagnoses to support his “lavish” lifestyle, according to the federal indictment. But Zamora contends that his father would dismiss patients who weren’t ill. However, the government claims to have identified several patients who were misdiagnosed by him. Additionally, two patients have publicly come forward and announced they planned on taking legal action against the doctor in a news conference held last month after his arrest. Both claim their health deteriorated after receiving treatment from him. Zamora said they’ve set up a Facebook page called “I support Dr. Jorge Zamora,” where letters, seemingly written by former patients to express their support for the doctor, are posted. The page is public and many users have also commented to speak favorably of him. Among the other allegations is that Zamora-Quezada tried to conceal the source of money they made from the scheme by investing in commercial and residential real estate throughout the United States and Mexico. Among the properties were two luxury penthouse apartments in Puerto Vallarta, Mexico; a condominium in Aspen, Colorado; a condominium in San Diego, California; and a condominium in Punta Mita, Mexico. However, the U.S. attorney handling the case noted during a recent court hearing that the property in Punta Mita was a time-share. Additionally, according to the indictment, he owned a Maserati and a private jet. Zamora countered that the Maserati was the only vehicle his father owned and the private jet was for practical use. He said commercial airlines didn’t offer a lot of flights to and from San Antonio that fit his schedule. His practices, Zamora said, was his father’s dream and at least three of his seven children have chosen to follow in his footsteps. Zamora just finished medical school in Guadalajara and, in fact, said he was taking his final exams when his father was arrested last month. Two of his siblings are also doctors. But with everything that’s happened, Zamora said he’s not sure what the future holds. “This just makes me really question: How are doctors seen now, and if I even want to practice medicine,” he said. He said his father worked hard all of his life to become a doctor, so much so that he didn’t see that much of him as a child.